Apple unveiled the next generation tablets of their iPad line at today’s special event: the iPad Air and the iPad mini with Retina display. This was another mobscene event at the Yerba Bueno Center for the Arts Theater in San Francisco, and like at most Apple events we are still waiting for them to release something that is actually new. This new iPad generation is apparently a whopping 72% faster than the original iPad, 43% thinner than the previous editions with a newly rounded bezel and is said to be the lightest tablet ever made. I give it to Apple for trying to make comfortable-to-use devices that have excellent haptics. 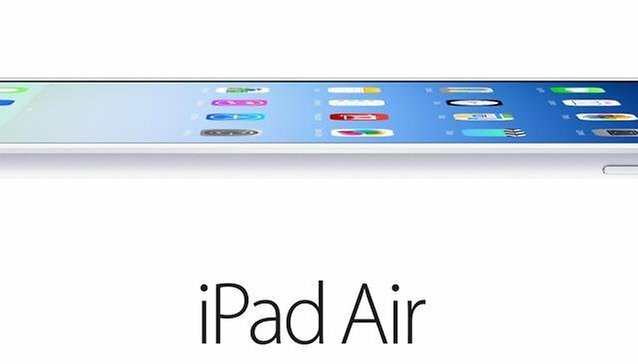 The new iPad Air will be available on November 1st 2013 in a variety of countries, including the USA, Canada and the UK, in multiple colors: silver, white, space grey and black. It's also interesting to note that the iPad Air will be available in China. Apple then announced a new version of the iPad mini, which will be storming stores on November 1st too: this version of the iPad mini will come with a Retina display, something that many users had been hoping to see. The 7.9-inch tablet, with a resolution of 2048 x 1536 pixels, will cost 399 USD with 16 GB of internal storage and Wi-Fi support. You will also be seeing the same new A7 chip with 64-bit architecture and M7 coprocessor. The iPad mini with Retina will be available with US mobile carriers AT&T, Sprint, T-Mobile and Verizon. On top of the new devices, they've announced a new cover for their iPads, which will cost $39 US. A case for the Air will be sold for $79 US and $69 US for the mini. So when will the next products drop? If Apple would start making not just the same old suff, maybe wearables and TV’s, like they’ve been alluding to, this would be a day when we might take some interest in Apple. According to the live blog’s poll on CNET, most people don’t even care about getting an iWatch. So maybe, once they've actually figured out where they want to expand, either home electronics, entertainment and such, then this will be the time when they start developing stuff other than their iPad and iPhone lines. What do you think of the new Apple iPad Air and iPad mini with Retina display? Are these innovative devices in your opinion, or are you waiting for Apple to drop a bigger bomb that always seems to be just around the corner? That's nice, the Air is on par with Xperia Tab Z when it comes to weight and thickness. I must agree, I do love the free download of Mavericks. I wouldn't dare pay for it - it doesn't seem like much of an upgrade, to be honest. I feel like I would snap the iPad Air in half with the sheer will of my mind. I liked the tweet from the CNET coverage: ''you mean we need to enter passwords with our FINGERS? On NON-GOLD iPads? Like ANIMALS?!?'' Bahaha! I like the MacBook Pro price drop though. And free Mavericks is nice too. Is an iPad Pro the next thing on the list? It's gonna be a hard sell (other than to existing Apple fans) to spend $400 bucks on a iPad mini when you can get a Nexus 7 at almost half the price. Can't wait to put these two up against one another!